Born in Arkansas in 1878, Karle Wilson Baker was a poet and writer who was most known for her poetry collections The Burning Bush and Old Coins and her novel Family Styles. Although she was brought up in Arkansas, she moved with her parents to Texas and fell in love with the state’s history and people, writing extensively about its everyday life. Baker was well educated and eventually went on to the University of Chicago and her love of poetry undoubtedly received its spark when she met poet William Vaughan Moody who had written The Great Divide. She also got to know other literary notables at the university such as Robert Herrick who wrote novels about the industrialization of America. Initially, Baker wrote under the pen name of Charlotte Wilson and contributed a number of individual poems to a variety of magazines including The Century and Harper’s. She published her first collection, Blue Smoke, in 1919 and followed that with the Burning Bush and Old Coins during the 1920s. Having moved to Nacogdoches in Texas, she continued to teach, undoubtedly her first love, and met and married Thomas Ellis Baker in 1907. They had two children, her daughter Charlotte going on to write children’s books. 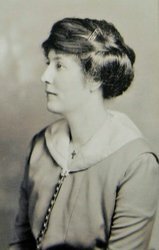 Baker became a teacher at the Stephen F Austin University where she wrote The Pine Tree Hymn which was eventually taken up as the college song. Her later works were a mix of descriptive non-fiction such as the much loved Birds of Tanglewood and the novel Family Style that explored the life of a family during the Texas oil boom. Baker soon became one of the best known writers in Texas and won many awards during her lifetime. She was also the first female to be awarded the Fellow of the Texas Institute of Letters. In 1931, Baker was nominated for the Pulitzer Prize after publishing the poetry collection Dreamers on Horseback, but in the end she lost out to Robert Frost who won for his Collected Poems. Baker’s poetry was noted for its short simplicity and the uplifting and poignant nature of her subject matter. Her most popular works were verses such as Let Me Grow Lovely which is still used in anthologies today. In a recent biography by Sarah Jackson, Baker is noted for her battle for recognition at a time when the literary world, particularly in America, was dominated by men and where women were often placed in the shadows and dismissed as irrelevant. Baker’s body of work is probably far more appreciated today than it may have been in the first half of the twentieth century. She was, in addition, a remarkable teacher and this may have been because she spent most of her life believing that she was still a student and that she was never too old to learn. Baker died in 1960 at the age of 80 having received more recognition and honours than any other female poet of the 20th century.